LAS VEGAS (CES BOOTH #14200), Jan. 6, 2014 – Sony Electronic’s new high-end, wearable Action Cam adds full HD image capture to its range of point-of-view video capabilities. The HDR-AS100V also adds 24p, high-speed shooting modes, and a high-quality still camera – all combined in a splash-proof body that lets the device be used without a waterproof case. The result is a POV camera perfect for capturing life’s adventures for playback on a big screen or the web. For the first time, Action Cam delivers Full HD broadcast-quality video in XAVC S, a consumer friendly format based on the XAVC codec developed for 4K/HD and professional use, at up to 50Mbps thanks to an all new BIONZ X processor. High quality XAVC S recording with 50Mbps high bit rate data transfer enables the AS100V model to capture quick action with extremely smooth image motion. Additionally, this model now supports 1080/24p video and high-speed 720/120p or 720/240p shooting with sound captured by its built-in stereo mic for slow motion footage with quality audio. And in photo mode, the new Action Cam can capture detailed 13.5-megapixel still images while Interval Still Recording mode offers 2-megapixel (1920×1080) time-lapse photography. With a cool white finish, the AS100V model’s all new splash-proof body means shooters can use it in rain or snow without its supplied waterproof case. Its slim construction was designed with eye-level recording in mind, and the compact, narrow body makes it more svelte and stylish. The new Action Cam offers Sony’s unique advanced SteadyShot™ Image Stabilization which more than doubles the camera’s stability versus its predecessor. The new and improved stabilization automatically adjusts for different frequencies of vibration, from mild oscillations while walking to rapid vibrations when riding a motorcycle. A premium ultra-wide ZEISS® Tessar® lens yields an impressive 170-degree viewing angle (120° with SteadyShot on) to capture all the action on dynamic terrain like ski slopes and mountain trails. Perfect for panoramic landscapes, the AS100V model also steps up its Exmor R® CMOS sensor from 16- to 18-megapixels for superb images with less noise in low-light and night conditions. The addition of a second tally light on top of the camera provides instant visual assurance of start-stop recording status. To satisfy serious filmmakers, the new Action Cam model offers a choice of color settings for extra creative flexibility when editing footage. Consumers can shoot video with ‘Neutral’ image quality or opt for ‘Vivid’ to achieve rich, powerful colors. Aspiring directors will soon be able to take advantage of Action Cam’s ability to record video with time code, to synchronize shots when editing scenes from multiple cameras. Editing with the time code will be available on Vegas™ Pro, XAVC S only. The “user bit” function records information such as date/time/scene number which is extremely useful for editing movies filmed with two or more cameras. The new model offers a choice of several recording modes with MP4 and XAVC S, as well as the ability to capture images upside-down when the camera is inversely mounted. In another first, consumers can wirelessly control up to five Action Cam AS100V units using the wearable wristwatch-style Live-View Remote (model RM-LVR1). To use Multi Camera Control, RM-LVR1 not bundled with AS100VR may need to be updated to version 2.00 by the user. This optional controller is waterproof and syncs wirelessly to the video cameras for easy operation when Action Cams are mounted in hard-to-reach places like helmets, kayaks or surfboards. Near Field Communication (NFC) and Wi-Fi allows users to instantly share their Action Cam content on smartphones or tablets using Sony’s free PlayMemories MobileTM app for easy upload and camera control using any Android or iOS compatible device. A scheduled update in Summer 2014 will add live video streaming capabilities and let the camera relay live video wirelessly to an Android or iOS smartphone so users can easily transfer footage to the web for sharing online. The update will also allow a burst shooting feature, where 13.5 megapixel high-quality still images can be continuously shot. Once it’s time to play back footage, simply transfer content to Windows® or Mac® via USB then use the latest version of Sony’s PlayMemories HomeTM application to edit files and post to social sharing sites like Facebook® and YouTube™. The PlayMemories Home app now allows shots from up to four cameras to be merged into one exciting split-screen video composite. On-board GPS can be used in conjunction with PlayMemories™ Home to make viewing and sharing videos fun and easy. Consumers can also chart adventures or plot routes using Map View’s location and trail information or create a speedometer-style video overlay using Multi View’s recorded speed information. With Sony’s PlayMemories Online App, users can upload images and videos to Sony’s free cloud-based storage service for easy access from multiple entertainment devices. The camera also features expandable memory with a Memory Stick Micro™ and Micro SD/SDHC/SDXC card slot, an external mic jack, and an HDMI® output for sharing Action Cam videos on an HDTV (HDMI cable required/sold separately). 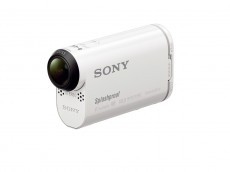 Sony Electronics offers a more than 26 mounting attachments to suit all types of activities. A new tripod adaptor is supplied with the new model for use out of the waterproof housing, so it can easily attach to a variety of mounts. Newest mount additions also include an Action Monopod (VCT-AMP1), Hard Lens Protector (AKA-HLP1), Camera Leash Pack (AKA-LSP1), Arm Kit (VCT-AMK1) and Live-View Remote Kit (HDR-AS100VR). The new HDR-AS100V point-of-view video camera from Sony Electronics is available for pre-order and will be available at retail in March for about $299.99. The HDR-AS100VR bundle will include the new Action Cam with a Live View Remote for $399.99. The current HDR-AS30V model will be offered at a reduced price. These cameras and all other accessories will be sold at http://store.sony.com, Sony retail stores and other authorized retailers nationwide. For images and information, please visitwww.sony.com/news. Find out more through http://blog.sony.com and make sure to catch what people are saying about #ActionCam online.